In October 1952, the late Mr. F. Grimme, Chairman of the Board of Governors and a great friend of the School, started the project by digging the first spadeful of the foundations. The Education Committee had sanctioned the scheme on the recommendations of the Governors and the N.E Divisional Executive Committee. The scheme was estimated to cost about £1000 and in spite of rising prices the actual cost came in at £1,040. Every boy in the third and fourth year from 1952 to 1956 played a part in this construction. The scheme was fortunate in the appointment of Mr.J.R. Strutton as the Building Master, whose broad experience in the construction industry plus his patient coaching of the boys helped to overcome numerous difficulties which would have floored many. 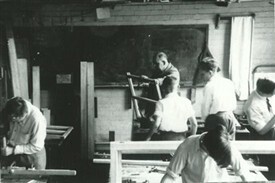 In this he was ably assisted by Mr E.E Harden (Woodwork) and Mr Crocker (Metalwork). The construction began in October 1952, and one year later the first of the technical stream arrived at the school. Sadly your author, and a member of this illustrious band of artisans is very rarely seen in such endeavours owing to the fact that he could no more make a window frame than fly to the Moon! But he did learn how to cut a ‘Queen closer’, and lay bricks, either in Flemish or English bonding; indeed he is attributed with building one of the corners of the workshop!! As a class we were drawn from a catchment area that included Egham, Staines, Walton-on-Thames, East Molesey, Hersham, Mickleham, Dorking, Kingston, New Malden and one cheeky local lad who lived within walking distance and still arrived late!! I’m referring of course to the irrepressible Francis J. Reed. In September of 1953 we were virtually all strangers, but by the time we had completed that workshop we were a class united by a great camaraderie and a strong bond of friendship that has endured 60 years! Sadly the passing years have taken their toll and our numbers may have diminished, but the memories still live on. How successful were these schools? The Tripartite System, ( grammar, secondary technical and secondary modern) as it was known, was the brainchild of Winston Churchill, who saw it as a way of improving social mobility, and eroding class barriers. But the resources for implementing the system were slow in coming. The logistical difficulties of building enough secondary schools for the entire country delayed the introduction of tripartite education. It was not until 1951, that the system began to be widely implemented. Very few technical schools were opened, due to the lack of money and a shortage of suitably qualified teachers. This failure to develop the technical part of the system undermined the whole structure. The tripartite system was, in effect, a two-tier system with grammar schools for the academically gifted and secondary modern schools for the others. But these technical secondary schools provided an education for around 70% of the UK's school children. Existing beliefs about education and the failure to develop the technical schools led to the grammar schools being perceived as the superior alternative. Working on the roof with no safety equipment in sight. In hindsight, it was a vital opportunity lost, but for those of us who were at the forefront of that development, in particular the 20 boys of the technical stream at Garth, known as 3T ( Building Construction) , it was a whole new experience in many ways. Our bespectacled headmaster was a Welshman, indeed he was born in the coal rich valleys of South Wales, and judging by his square cut features, and stocky build you could be forgiven for thinking that he had been chiseled out of the coalface! As a teacher he was expressive, colourful, and innovative, never afraid to step ‘outside the box’ but throughout our time at Garth he displayed a Messianic zeal and belief in his “boys”, which in many ways helped to forge long lasting links between the school and the boys. 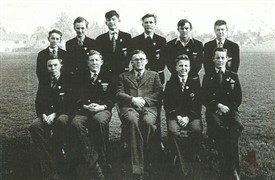 Mr Hugh Morris OBE, Headmaster with the school prefects. Class photo taken after completion of the workshop. 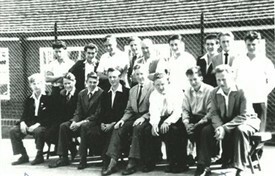 Back row from left to right Johnny Poole, Freddie Mole, Johnnie Tipple, Chris Stocks and Mr Harry Strutton, the brickwork master, Eddie Blanchard, Roger Carnegie, Michael Ferris and Frank Reed. Front left to right; Dave Squire, Jack Roach, Peter McDonald, Gerry Batchelor, Bill Lake (Wilbur), Michael Spellar, Rob Todd and Maurice Cooper. A disciplinarian, he won the respect of many in the school, but he was fair and he cared; he also believed that it was his personal mission in life to identify the latent talents that so often go un-noticed in the under-achievers. As an individual Hugh Morris OBE possessed boundless reserves of drive, energy and enthusiasm, he was a teacher with a passion for education and teaching. Whereas today in many secondary schools, the number of 16- to 19-year-olds rendered functionally illiterate or innumerate has failed to improve over two decades, yet every one of the twenty boys who started the new scheme in 1953, left school in 1956 with at least one pass in the General Certificate of Education, and several had five or more passes. Moreover several went on to achieve positions of seniority in the construction industry. This page was added by Beverley Walker on 28/04/2013. What a fantastic article! Well written indeed. Nice pics too. Whatever you may think about the relative merits of the technical secondary schools the education that we received at Garth helped to enrich our lives in many ways. For example, Hugh Morris decided in 1956 that we should gain an insight into the system that had given the UK some 700 years of stable government- it was time for an election! He asked Wilbur to head up one Party which the Head had already termed the Steadfast Party. I was asked to head the other Party, which I subsequently called the Progressive Party. We were both required to put together our own manifesto, and we were given 15 minutes every day to "sell" our beliefs to the boys. After a week of campaigning , election day arrived. Voting booths were made and put up in the Hall. 'Voters' first had to register before casting their vote. At the end of the school day the votes were counted and the result declared by the Returning Officer, in this case, Jack Roach. The result was a landslide victory for the Progressives and as the Party leader I gave the customary vote of thanks speech to the whole school . In hindsight it was a pity that the history lessons didn't include an insight into the British Constitution, the meaning of the Rule of Law, Habeas Corpus, Trial by Jury, since today we are seeing that system gradually fettered and rendered obsolete by a system that is neither transparent or accountable , indeed the auditors have failed to write off the EU's accounts for the 15th year in a row, such is the scale of fraud and corruption within Brussels. Hi all. My name is Tony Rivers. I was a pupil at Garth from 1954 to 1958. I came up the ranks, as it were, from junior and infants school across the football pitch. That school was called Lilleshall Road school and I lived just up the road at 53, Leominster Road with my parents and grandparents. The main picture of the building block must have been taken after I left because I can clearly see the cricket pavilion at the back which I helped build, the building block having been finished by then and we were engaged in putting right all the mistakes of the previous years!! (only joking). The first part of the building block was turned into showers for us grubby little 'erks' who got themselves coated in mud via the football/rugby pitches. I also remember there was no heating either!! I've never actually seen a picture of the finished pavilion as I was instrumental in doing the ground work and foundations. I was also instrumental in providing the class with a laugh when we were 'mucking about' with the morter and a stepping board by placing a well aimed shot into the air which landed on Mr. Struttons' balding head!! Needless to say we were all marched up to Mr Morris and received a well-earned thrashing. 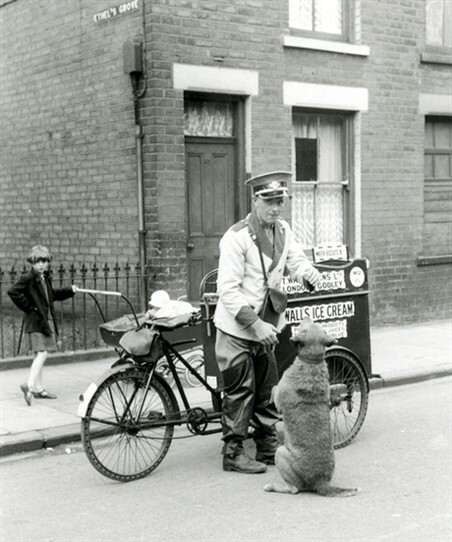 (yes, it was still legal in those days!!) I've got so many good memories of Garth and of all the teachers and especially of Mr, Morris who wrote me a very nice end-of-term letter to my next employer. I've still got it in fact. In the picture of Mr. Morris with his prefects, I'm the one at the back, far right,and I believe the the snotty-nose kid sitting next to Mr. Morris on the left is my old mate Phillip Aslen whom I haven't seen for years (are you still alive and kicking boy?) I'll leave you this time with a few of Mr. Morris's old (and wise) sayings. They Are: 1) "I'll come down amongst you like a ton of bricks 2) Pull up the ladder Jack, I'm all right. 3) It's me first, me again and anything left over it's me again" All these were normally shouted out at top welsh-voice-choir level in assembly, to all those deserving of course! I'm sorry he is now gone but he is definitely not forgotten, in fact I've still got his obituary if anyones' interested. I'm glad that his final resting place in in Randalls Park Leatherhead because that is where my family grave is and where I will end up some day. (not too soon I hope-I've got more memories to tell!! As I remember it the school did not offer G.C.E. 's but we all did C.S.E. 's (certificate of secondary education) with an option to do a thing called 'Prelim Tech' whatever that was. I had to take my G.C.E. 's at Wimbledon Technical College after work. Hi all. Before we got to the 'big school' i.e. Garth Secondary, we went to the 'little school' across the football pitch which was Lilleshall Road school. I remember the infants class where we all had a little sleep in the afternoon on little canvas camp beds, not that many of us slept but I don't seem to remember any large-scale opposition to this so I suppose it all went off quietly!! Then of course we had 'nitty nora the flea explorer' that was great fun for some! We then progressed up to the Juniors where I remember 'music and movement' and having to do 'country dancing' with the girls....yuk!! Then came the big slammer.......'11 PLUS!! that was horrific, I remember being horribly sick at the time which was probably why I failed the 11 PLUS and went instead 'across the football pitch' to 'Garth' Anyway, I think that junior school went off O.K But I cannot for the life of me remember the headmaster (or mistress) name. Anyone out there remember? In response to Tony Rivers question the headmaster of the Junior School was Mr Price when I was there. I have a vague memory of the head mistress of the primary school but not her name. I left Garth in 1975 from memory having been in the second of the 6th years. 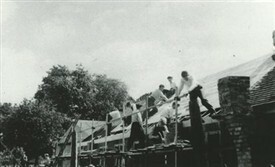 The building workshop shown above was demolished to make way for the new hall. One end of the building workshop was used for woodwork with Mr Colclough who also taught Geography ( and was pursuing a young lady in Denmark !). I remember the new hall going up and the new science block. That did for the Juniors swimming pool where I learnt to swim as well. Who was it who threw the bottle of ink out from the science block window into the swimming pool I wonder ? There were still air raid shelters on the Green in Lillieshall Road as well as a Blue ( Dr Who Style) police box. I quite agree with the comments about Mr Morris above a true inspiration and leader. He made people who dropped litter take a bin round the school grounds collecting litter until someone else was found dropping litter. He also insisted that any visitors who arrived at the gates were escorted to the school office by the first pupil to see them. Good times, it was depressing to see how the school decayed after he retired. Sunday 9th August 2015. My time at Garth School. I was amazed tonight to find this website. And I do not really expect any replies or reaction or follow-up to my entry because I am now 73 and lots of the boys at the school, when I was there from 1953 – 1957, will not be alive. But for what it’s worth, here goes. The picture of prefects, with the head, Mr Morris, on the St Helier Memories website, could possibly be me in the back row – with the big ears! I remember the culture of the school. Many of the boys were not interested in learning – they had jobs lined up to go to. However, I took full advantage of the school and all the teachers – I think I was the only boy to revise for exams and I came top in everything. Following this, Mr Morris rang the principal of Carshalton Tech and asked her if she would be prepared to break the rules (I was 15) and accept me on to an O level course (usually FE is for 16 upwards). She was. I have Mr Morris to thank. I then went on later to university and then into teaching and since 1970 I have been an academic educationist teaching at three universities in Leicester and Leicestershire, with lots of degrees and honours – and I am now a visiting professor, still writing and researching on education. Just google my name and my De Montfort University profile appears along with many of the books I have written. When I lecture on the history of education, some of my undergraduate students say – how do you know so much? Sec mods, grammars, comps etc. I tell them that I was there! Been to 14 schools so I should know a little about education (from the inside). I have since visited over 500 schools all round the world as part of lecturing tours and research. Given my academic credentials, I have clear memories of Mr Harden, the woodwork teacher, regularly calling me ‘duffer’ (instead of Dufour) in front of all the boys. He thought it was highly clever and amusing. I think I have now proved I am not such a ‘duffer’!. Another ex-boy at Garth was the famous actor, George Cole, who has just died. And I was touched to find out that one of my academic colleagues at De Montfort University, Leicester, Dr Austin Griffiths, once taught there. I don’t remember that story about the technical school. It was just a secondary modern to me but I remember Mr Morris telling me how unfair it was that secondary modern pupils had to leave at 15 and so could not do O Levels. He wanted to change things, thus the technical idea. Please write to the site if anyone from Garth, Lilleshall Road, 1953-1957, sees my entry here. I left Garth school in1952. I first knew it as Central No.3 Boys. Then Lilleshall Road. I came from Infants/Juniors in Llanthony Road. My first Headmaster was Cotterell? He had a team of Masters who were all into discipline in a big way. Corporal punishment was a way of life. Most days someone got a good hiding. The day started with classes lining up on the sides of the playground to begin marching drills. Then assembly and finally classes. Three teachers stick in my mind. Restel, Crocker and Harding. Restel had a cupboard for canes and used them on a daily basis. When he left he went to a Public school. A few years later he was done for GBH on a pupil. Crocker's thing was hold a brick at arms length at the front of the workshop. I remember you had to polish your job when finished. Crocker would issue a small strip of emery cloth and you would just keep rubbing until it wore out. I got a clout from Harding once for sharpening a pencil with a chisel. Oh and Mr. Yeates, sports. It transpired that teaching standards were poor and we were 2 or 3 years behind other schools. After two years Mr. Morris became Headmaster. I have to say I admired and respected that man. And he did so much for the school. On his first day we had just started our usual marching when the science room window was thrown open with a bang. He was almost out the window, bright red in the face absolutely livid, and stopped the marching. We were told to carry on, the Masters my office now. Eventually lessons resumed. Playtime, he was out with us talking to pupils on what went on. One of his first questions was where are the balls? Of course under the old regime we weren't allowed to play football in the playground. Shortly after he arrived almost all the old Masters were replaced. A few weeks before I left school Mr Morris addressed our class and apologised for being unable to get us up to standard. He didn't have to do that but that's the sort of man he was. What a star. Someone mentioned earlier Prefects. I was one of the first. Twelve I think. Still got my badge. I'll throw in some names from my time that I remember. If anyone knows what became of them let me know. Brian Killian, Tommy Radford, Brian Hunt, Tony Boustead, Peter Angel, Johnny Took, Larry Lunn, Ken Moore and Mike Dixon. I know about Sid Satchel and Ted Lewis. What a wonderful surprise to come across this site. I too was at Garth School from 1956/57 to 1960/61 and remember Mr Strutton, Mr Harding, Mr Crocker. I can also add the names of Mr Brammer, Mr Cripps, Mr Day,Mr Marshall and a young Mr Griffiths. I was actually born in Carshalton and lived at 22 Sherbourne Crescent. I spent time at No.9 school Green Wrythe Lane but then moved to the Morden side of the St, Helier Estate. I joined the junior school at Garth and my brother Gordon went into the senior section albeit my recollections of the junior school are not that plentifull. My memories of both the senior school and the St. Helier Estate are another matter in that I enjoyed the company of a number of 'St. Helier' boys at the end of my education. These included the now deceased Terry Boustead (younger brother of Tony Boustead as mentioned by Jack Goodchild), Terry Hart*, John Looney*, Johnny Wells*, Johnny Holbrook*, Tommy Higgs*, Mick Bradford*, Ian McIntyre*, Kenny Lowe*, John Braddick* , Kenny Bridgeman* Alan Cardew. I still have a class photograph of Class 5T and can add the names of many of them i.e. Chris Stribbling, Bruce Davy, Alan Suggars, David Grant, Colin Carroll, Terry Fisk, Teddy Horton and Robert O'Keefe. The names which have an asterisk by them are, would you believe, friends who I am still in touch with and meet up with 2 or 3 times a year. Kenny Bridgeman reminded me recently that we had first met in the 8th Mid-Surrey Life Boys when he was 8 years old! Finally, I have to make mention of the Head Master of Garth School Mr Morris who has quite rightly attracted so many words of appreciation. Yes, he was strict but he maintained a great desire for his pupils to achieve. A lot of us owe him a great deal. Hi John. I was pleased to see your reply to my article of the 16/11/15 and yes we did live round the corner in Malling Gardens. Sadly Maureen and my other two sisters have passed away but my three older brothers are still alive. I remember you well as I used to watch you and the likes of Peter Angel playing football on Moreton Green. Peter Angel I seem to remember was a very energetic footballer and you were known as a "classy" footballer. I also remember Roy Tait (always smiling) and his younger brother Alan. The names of Terry Ince, Frankie Reed and Geoff Kirby spring instantly to mind but I can't quite picture them. I'm thinking that Terry Ince was a fast left-footed footballer, Frankie Reed was always joking and Geoff Kirby lived in the road opposite the main entrance to the school??? I agree that the estate was a great place to grow up and as mentioned previously, I too still meet up with lads who I became mates with playing football. Hi Roy having read your piece I can say your memory is a lot better than mine mate. I thought you must be Gordon's brother and I was very sorry to hear about Maureen who I know was one of the younger members of your family. As far as football is concerned I don't think Peter would mind me saying he was more of a bruiser than a footballer. Terry was certainly quick and so was Frankie and you are right that Geoff Kirby lived in the road opposite the main gates to the school as did a load of lads we knew. A lot of us also went to the Phoenix youth club based at Malmesbury Road school. Great memories and friendships and I am always proud to say I came from the St Helier Estate----- we should never forget our roots. All the best John Palmer. I was at Lilleshall until 1953 and had part in painting the sky on the coronation picture that Bishop the art master instigated. I can only remember a few names Angel, Hudson, Kirby, Goodyear, Reed, Becket. What a great start we had as the emphasis was on sport as much as the usual subjects. I wonder if anyone made it as a boxer as seemed the ring was always erected. Love to hear from anyone still alive who came through the infants, juniors and to the seniors who would have been born around 1941. I started Lilleshall Road primary school in 1951. I don't remember too many names but do remember the trip to a holiday camp in Dorset somewhere. We stayed a week in chalets and Miss Bailey and Mr. Alexander were the teachers who went with us. I also remember Scottish Mr Watson. Miss Holmes was the nursery teacher. I remember a Jimmy Manooogian, Dorothy Suldana, Linda Bowyer and her sister Lesley who lived right next to the school and sisters Helen and Veronica. I went on to the Willows County school after the eleven plus and the rest is history. After stumbling across this webpage, I too was born and bred in Carshalton in 1940 and like many correspondents, I attended number 3 Lilleshall Road schools; infants, juniors, seniors. I wish to take to task Tony Rivers admission, that he is the person back row, far right; in fact that is my old mate Jeff Kirby. How do I know that? I am the little guy back row, far left - Len Coppin! I was at Garth from ages 11 to 16, starting in 1960, having failed the 11 plus. Garth was known as a Secondary Modern school. Mr. Morris, affectionately known though not to his face as Old Mole, was the headmaster who, as is often mentioned in the writings above, was an all round good egg, a dedicated teacher and a role model for all of us. Reading the letters above brings back teachers names. Mr. Colclough, nicknamed Wally, although not for derogatory reasons, stands out as a geography teacher. More of him later. Mr. Strutton, building, Miss Ballantyne who was a young red headed and very pretty teacher of French who, of course was much admired by the older lads but who didn't have a hope of controlling us in class, Mr. Crocker with his metalwork, Cuckliffe, English, Harden, woodwork and another called Mr. Cripps and I can't remember what he did. At 13 we did the 13 plus exam and if we passed we went into the T stream. T was for technical. What a laugh! But by the time we had reached 5T we sat G.C.E. examinations, R.S.A. examinations and a maths exam. from the College of Preceptors whoever they were! At the very last, C.S.E. 's came in and we took a couple along with the G.C.E exams. Later the C.S.E. 's evolved into G.C.S.E's. I didn't get too many of any of them I am afraid but that had more to do with me spending too much time fishing on Cannon Hill Common and not enough time studying! Fellow pupils I recall are Messrs Clark, McGregor, Charlton, Prior (whose Dad was the caretaker), Lever and Hofsten. Only a few. Noteable instances include a teacher, Mr. Cuckliffe I think, having a fire at his home and burning his hands, the physics teacher whose name escapes me but who had a penchant for throwing the wooden padded blackboard chalk eraser at pupils having it thrown back at him just as he was taking a sip of tea and the eraser hitting the bottom of the cup with very damp results, a pupil whose father ran a bakery and who delivered cakes and buns daily to be purchased from the building workshop, (all that sugar. Take that, Jamie Oliver!) and a Welsh teacher of English, who I think was our form teacher, telling us that we had to do well enough at school so that when we left for the world of work we would get a job which paid £20 a week..............a £1000 per annum. How laughable that is now! Back to Wally Colclough. He arranged a geography field trip to Snowdonia for a small group of third year pupils and my pal Ian McGregor and I were invited along too. Along with a couple of other teachers. We camped. We travelled in a Bedford Dormobile van and one evening in the back of the van as we were cooking a very large pan of delicious stew on three small individual Camping Gaz stoves, one of the canisters ran out. One of the teachers carefully slipped it out from under the pan intending to put a fresh cannister on and slip it back under the pan. He unscrewed the 'empty' canister but the last vestiges of gas came out, enough to spread about in the van and then caught alight by the flames of the other two stoves still burning under the pan! A flash and a bang as we all piled out as fast as we could, landing in a mud patch and quite singed and knocking the stew over! I burned a hole in the back of my bobble hat. We threw the still spurting cylinder away and had to sweep the stew out of the van and ended up feasting on cornflakes. A good laugh and nothing more was said, even when we told our parents. Can you imagine that happening in these days of Health and Safety? Law suits and compensation flying all over the place! That's how I remember you, Mr. Colclough! And a really good bloke, too! Are you still around? Garth was a good school. I could go on and perhaps I will at a later date. I have just been given a link to this site, and the comments about Garth Secondary made interesting reading and sent me on a nostalgic journey down memory lane. After my early years at Lilleshall Juniors I did go across the football field to the big school and was there until about 1952, at which time I took the 13 plus exam but my aptitude did not lend itself to being offered a grammar school position. However, I think there was a follow up exam to determine if unsuccessful students had a technical bent, which to my amazement, I apparently did, so was sent to Canterbury Road Tech in Morden until 1956. Some of the teachers names seemed familiar, the one with a penchant for caning for instance walked back into our classroom one day just as I let out a yell after the boy behind me pinched, or kicked, or punched me. No questions asked I was ordered out into the corridor for six of the best (my only ever time). The Head Master too, Mr Morris is remembered with the same affection as the comments made by the other old boys. I once bumped into him during the summer holidays in Derbyshire. Some of the villages there have a custom of "Well Dressing". They decorate the wells and springs with flowers to give thanks for the purity of the water which helped them through the dark period of the "Black Plague". At the first morning assembly after the holidays he told of the tradition to the whole school and referred everyone to me to collaborate his story. Well --- Its incredible to read all the above pages about Garth. I see that I get some "honourable mentions" too. I didn't know that that was my nickname!! I arrived at Garth in 1960 (I think) and left in the late '70's when I was appointed to be Head of Eastfields High in Mitcham. Garth was a fabulous school, and all the words I read about Hugh Morris are SO true. He certainly was my mentor. I read all you say about Strutton, Crocker and Harden and of course there were many other fine teachers associated with that school. Remember Harold Healey, the Deputy and Delme Thomas, who was Deputy at the Canterbury Rd site when Garth amalgamated? Then the girls came, and what a difference that made! We were then a 13 to 18 High School and received many accolades in that role. But all the fine memories revolve around the true grit of the St Hellier Estate which somehow Hugh Morris REALLY understood. I so clearly remember his retirement day, the lines of pupils across the playground to the gate. He shook hands with everyone. Eventually I became the Deputy Head and I learned too how to manage and lead from the inspirations which came from Hugh and ALL the fine colleagues and students of that place, so vivid in my memories. Remember Hugh's assemblies? Yes, then I married, went to Mitcham, then to Head an international school in Denmark, then back to UK to the Inspectorate, then retirement here to Southern France. Now, aged 77, I raise a glass of fine Rose wine to everyone who has written on these pages and every former pupil, and who remember me and wish you and yours all the very best. Stumbling on to this site rolled back the years and compelled me to comment. I was brought up on the St Helier Estate and went to Malmesbury Primary School until 1961 and attended Garth from 1961 to 1966(5T). In later life I realised how true it was that excellent teachers are never forgotten.Hugh Morris was an inspiration. Crocker passed on metalwork skills that served me so well as an Armourer in the Royal Marines. John Colclough even found time to collect and drive me from home to school after I broke my leg in the run up to those first CSE exams in 1966. Those brickwork techniques taught by Strutton have been used many times improving and repairing properties, saving me pounds. I will never forget the crush I had on Miss Ballantyne as she tried to teach us French. Other names I remember are Sutcliffe, Healey and Harden. I too went on the camping trip to Snowdonia and recall waking up in the Llanberis Pass amazed at the enormity of the Mountains. I left Garth in July 1966. I joined HM Royal Marines in October of that year and served world wide for 39 years being discharged in 2005. Its worth noting that Graham Hurst from 5A (1966) joined the Corps with me but sadly passed away in 1967 of natural causes. I am now retired and live on Dartmoor. A far cry from the St Helier Estate but may be it was that school trip to North Wales that made me seek the wilder parts of the UK. 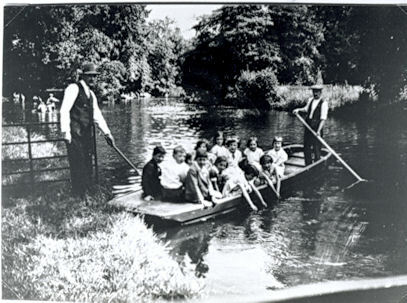 Going back to the 50s, Anyone remember a place you could go during the summer holidays called, I think, Shepatch? Some of the lads went, might have been 1950, and at assembly Cotterell had them tell of the experience. They sung a song popular at the place and ended up getting a beating for being ungrateful. Tommy Radford and Jonny Took. I had the pleasure of being a pupil here from 1973-76. Sparsely attended from 62 biggest memory was Lesley Gosling playing the piano. I came across this site by chance ,researching another project,and was intrigued by the amount of content on my old school Garth Technical Secondary. I remember some of the names who left school in the same year as me 1952. I remember the name of Jack Goodchild one of the contributors to this article,plus Brian Hunt who wanted to be a chef, Mike Dixon who was very good at all things mechanical.Les Allen who was keen on trad jazz and learned clarinet,Michael Stewart who went to work at Shannon Systems in Malden. The headmaster Mr. Morris, who was very progressive ,and would have contributed more to my education had I stayed longer. Just to add to Peter Snare's post. Mike Dixon was a good artist, tried for Sutton Art School but never had the qualifications. Les Allen used to collect birds eggs. Don't remember Stewart or you for that matter. Sorry Mate. Don't get old. Few more names for you. Bonzo Bacon, Lennie Farrier, Brian Killen, Ken Moore, Larry Lunn and Gino Botachi? Turns out Mr. Yeats was Sid Satchel's uncle. Sid is no longer with us unfortunately. Ted Lewis was a London Fireman. In many ways I had a head start over many, since my earlier years were spent at New Malden East, where the headmaster was H.C.Morris !! Even in those days he was very keen on encouraging mental arithmetic. He suddenly enter the class and in his usual strong voice,- "11 times 11 take away plus 23 divide by 12...Answer ! Many years later I visited at his home in Sutton. It was getting dark and he didn't recognise me at first. "7 times 9 minus 8 and so forth". "Hello John, a lot of water has flowed under the bridge...his voice was weak. He was thinking back to the days when his daughter danced with us at the rec. Sadly she died of leukaemia some years later. Full of laughter with bright ginger hair, so he had a lot to contend with, but he never flinched. He then moved to Garth and in 1953 our eyes met once more! My main regret is that I didn't visit the school more often. He would have been delighted to learn one of his students was a Senior Research Officer in the Nuffield Research Group in Extraction Metallurgy, and PA to the late Professor Denys Richardson FRS another giant of a man, but a gentle giant. At my interview in 1962 we had been talking for over 2 hours and I began to think that I had the job. My brain went into a spin, he could see that I was struggling, but Denys was different to so many, " Well, he said, you know the log of 100, and the log of 10 is....therefore the log of 0.5 is...so the log of nought is? My brain was still spinning when I blurted out, "Infinity". "Not quite said Denys, nearly, try again. I started in 1962 and retired in 1992. The point of this story is that Hugh taught you/me to think on your feet ! So I'm very grateful to him in many ways. Can anyone tell me why the Local Authority decided to destroy the Building Workshop, the Cricket Pavilion and the Wendy House? Did someone have it in for Hugh Morris, was it just jealousy, what? Looking back most schools would have been glad to show those buildings off as an example of what could be done. Maybe it was the Safety issue.... ..... ..... ....! Have just come across this website and been wondering over the years whether I would ever meet up with guys I spent those 3 years with so long ago. Didn't think of just putting 'Garth School' into the computer just shows how little I use such a useful tool these days. All the teachers names come flooding back having read all your entries but few of my classmates names immediately come to mind. I may be remembered as a somewhat timid 13 year old given the opportunity to go to Garth several weeks after start of term owing to someone else falling out. I was also unusual in that I was bussed in to Morden via the 747 Greenline from Reigate so was not local and was forever watching bus timetables after school time. I do remember the pavilion which I had some hand in towards it's finish and the '3 year Building course' which is how the opportunity was originally described to me did infact lead to my becoming qualified as an FRICS and a life time in the property world. The practical bricklaying/metal and woodworking we were taught were always very useful particularly the Technical and geometrical and Mechanical Drawing classes which I much enjoyed. I still have most of my work marked 3T and a treasured item made in woodwork class of a sewing table with hinged lid and the body comprising lots of dovetail joints on a 45 deg angle with tapered legs. I feel it is an exceptional work for a 13 year old (i am prejudiced! )but after many years in garden sheds/garages it no longer looks pristine and it narrowly escaped the 'decluttering 'over several moves, my wife is anxious to see it gone!!. I was always grateful to the rather frightening Mr Morris for seeing something in me which warranted him making me Head Prefect in my last year 1958. It did wonders for my confidence to this day, again how wonderful the seeds he did sow! A final memory for now was the final year dance with the girls from Malmesbury.! Our eager teenage urges were bursting forth but as ever practical staff at Garth prepared us by teaching the waltz to 'Around The World in 80 days' in the Gym whilst the young lady was represented by a broomstick! Does anyone remember this or me or have photos, I would be interested to hear. I have now retired and live in Ashtead. To all those boys who attended from 1952 onwards. Why did they demolish the outbuildings? I notice from Tony Rivers account that GCE was no longer the preferred public exam- why? Quite a few of us who took those exams in 1956 passed at least one subject, some did better and two or three obtained passes in 3 or 4 subjects. Why aim lower with CSE? It all rather confirms my suspicion that there were many who wanted to erase the memory of Hugh Morris OBE. Tony Colclough tells us that he is 77, well join the club Tony! Wilbur Lake, our Head Prefect I think he is 78! Wil actually passed his 11+ but he was never offered a place at Grammar School. Why? 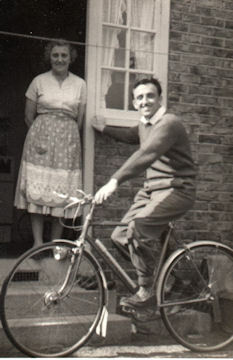 Wil reckoned it may have had some bearing on the fact that his Dad, a Battle of Britain hero died during the War and those that made those decisions felt that his mother would have had real problems paying all the costs- sports equipment etc etc. I thought about that Wil and wondered if it were more a case of too many candidates for a few places, and they could afford to pick the cream. But their loss was our gain. From the day he arrived at the school from his home in EGHAM, we all liked him. In 1958 i took 5 GCSE'e but only got Woodwork (thanks to mr Strutton).It was embarrassing as head boy to fail although i subsequently obtained 6 via evening classes. Disapointed that no name i recognise or remember has come to light or anyone remembering me 1956/7/8 ?.someone must remember the lunchtime cafe visits we did ..waggon wheels and juke box..! The building workshop ended up under the 'new' assembly hall so had to be demolished. Looking at Google satellite view for 2017 the sports pavilion is still there with a corner missig which when when the 'new' gym was built. It also looks like the 'Garden Workshop' is still there in the trees. Not sure what you meant by The Wendy House though I can't remember that. Harry Bishop the art teacher in around 1955 was my father. I remember going with my mother to the school to collect him, I was around 5 years old. He was happy teaching and he loved all the children. After a couple of years he was offered commercial art work which he decided to do. This led him to draw Gun Law, a daily strip cartoon for the Daily Express and he also illustrated books, but he never forgot his teaching days. Hi Janet Bishop, I remember your father with great fondness. In 1954/5 he was my form teacher. A tremendous artist with a sense of humour. Not the greatest disciplinarian, just went with the flow to get through the day. You mention Gun Law in the Daily Express; at 77 is my memory correct that he also did the artwork for Dan Dare in the Eagle comic? The other thing I remember your father for was the murals he did for harvest festival, Christmas pageants and school plays. If you were talented enough he would allow you to "fill in" a corner of the artwork. Not only did he teach us the 3Rs he taught us about life - great memories Janet. Hi Len, it is wonderful to hear from someone who remembers my father from his teaching days, the way you describe him is exactly right. You have a great memory - yes he did do work for Dan Dare in the Eagle comic. He also did Tarna jungle boy for Swift and illustrated books. It is very sad that he is no longer with us, he died in 2015 at the age of 95. Its lovely that you remember him and also the murals, he would have liked that. He used to tell me wonderful stories and was a wonderful father. Thank you for your memories of him Len, its greatly appreciated. I was interested to read the comments about your father. Although I was never taught by him my elder brother Gordon, who was 4 years older than me, mentioned him quite a lot. He told me how he would have one boy stand at the classroom door as a 'look out' in case the headmaster Mr Morris came along, whilst allowing the rest of the class to watch football matches from the windows overlooking the football pitch which was situated between the junior and senior schools. He also told me about the time your father took the art class to the other side of the school playing fields in order to practice sketching the landscape. However, he spotted an apple tree and the first thing he said to the boys was "who can climb trees"? I am sure that it was this mischievous/playful aspect which endeared him to the boys. Hallo Roy, Thank you so much for passing on your brother Gordon's memories of my father. I think he felt that children's lives could be hard enough and liked them to learn in a happy and fun atmosphere. That said, he probably let them get away with more than they should which didn't endear him to Mr. Morris though! I think he took the boys for football sometimes and watched it until his eyesight began to fail in old age. He would never pick a side though, just loved a good game to be played fairly. Thank you again Roy, its lovely for me to hear these memories and I am glad he created some happy ones. I attended both Garth Junior and senior school from 1955 to 1963. I still think on average they were good schools - but both had great head masters. I have to thank Hue Morris for making me Building Prefect and Mr Strutton for putting up with me at the time, which given my academic achievement was a leap of faith!! Given I departed the school with no academic qualification - I like to believe that my engineerig degrees and master's degree in business I achieved post Garth would have delighted them both in the belief of their students. I have never returned to the school since I walked out of the school in 1963. I was saddened to hear the "student built buildings" have been destroyed. My memory is not good with names and the only fellow students I have contact with is Ian white and Ed Fails. The building skills I gained at Garth are still giving me a " hands on" skill in the DIY building of my Eco house in my semi retirement. I attended Garth between 1956-1961 hated the place but I see Roy Laming has commented saying Terry Bousted is not with us any more . I remember Mr Morris who I did not get along with . Hi I have just read the above with great interest. I remember the teachers well, Mr Bray the art teacher and Miss Ballantyne the French teacher. I believe I was one of the few who passed the RSA in French. I remember John Colclough the Geography teacher very well. Hi John. I do not know if you knew this but when I left school I worked in the Visa department of Thomas Cook and we actually handled all your visas for your school trip to the USA. I really enjoyed myself at Garth and remember Mr Morris as a brilliant head master. I seem to have fallen through a hole in time somewhere! I attended Garth between 1960 and 1965. I have just been looking at some historical publications my father left when he died and I looked up Garth thinking I might find out something about the family but found this page instead. I recognised the photo of Mr. H. C. Morris and then found an entry from Mr. Colclough who I remember fondly as dictating extensive Geography notes to 5T. I loved my time at the school but had to leave to take an A level course after Ordinary levels. Eventually I trained to be a teacher at St. Peter`s College, Saltley and retired as a head 30 odd years later. My thanks go to all the staff at the school I can remember Mr. Healey. Mr. Davis. Mr. Bray. Miss Ballantyne and the ones I cannot. I am so pleased to read the various inserts about life at Garth School. I well remember Peter Wilby, Colin Bradford and Mike Crisford – all keen soccer players. Now, which of them was it who taught me the “off side” rules?! I recall the many trips we made with local students to Snowdonia, leaving the school on Friday afternoon and driving into the night to set up camp at the foot of the mountains in the lights of the school’s ex-army minibus. We even managed to persuade the school cook to make up food for us once we had arrived. Then for a few from Garth, the trips to USA. Imagine three weeks of homestay in New England courtesy of various American High Schools and their families. Just £70 by Pan American Boeing 707!! Hugh Morris (headmaster) and Harold Healey (Deputy Head) joined us on occasion – first time Hugh had flown. Remember those two characters? Wonderful men and so much appreciated by the readers of these notes. 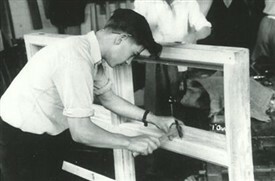 I helped out at the school’s building site with Jim Strutton and like others, learned lots of DIY skills from him. Do you remember how to hold a trowel? Then many others of my teacher colleagues too numerous to mention here. At Garth, I learned my skills to become a Headteacher too. Those were the days, forever in my memory. I stumbled across this site whilst meandering through the Internet, which, as usual, started with an initial search that was long forgotten when I hit upon ‘heliermemories’. I have to admit to have not being a model student or attentive at any time between September 1963 and gaining my ‘freedom‘ in ‘67. A situation, I believe, stemmed from my Father’s dismissive attitude towards education, believing that he could get me into the print, as his Father did many years before. It was probably just as well that, Father/Son nepotism, didn’t extend into the late 60's as that industry was decimated two decades later. It wasn’t until I joined the GPO in 1968 that I realised the value of education and physics in particular. My wife is often dismayed that I cannot remember the names of teachers or students but, this site has refreshed so many dormant memories. But, most of those reminders are of teachers, only the names, Peter Wilby and Leslie Gosling have come out as an “I was at school with them” moment. Peter, was it you that I bought a tandem from, for 7/6? And didn’t you buy it back for the same astronomical sum? Leslie, it was with you, that I discussed Harold Wilson’s election victory in ‘64? It was delightful to find this repository of memories of Garth Schools at which I was a pupil: the infant school from 1956 to 1959, and a term in the junior school, before moving away from Morden. It was a short walk to school and I'm amazed to recall that I was allowed to go to school on my own at the age of 5! My first infant school teacher was Mrs Fincham, one of the few teachers who drove to school. She would park her light blue Morris Minor in a shed on the far side of the playground. Mrs Betterton, my teacher for almost two of my infant years, was everyone's favourite. She'd drive from her home in Surbiton, and sometimes brought her son into school. The Headmistress was a scary Mrs Hall: scary, I suspect, because she once smacked me on the leg! While I was in the infants, the school opened its new swimming pool - possibly in 1958 - paid for, we were told, by the parent-teacher association. I've a vague recollection that the junior pupils used it frequently, while infants were allowed to use it occasionally. For my one term in the junior school our form teacher was Mr Alexander, and I also recall a Mr Horton, a senior school teacher whose son, Paul, was a friend in my class. I'm sure that during my time at Garth, teachers began to inspire a love of English, which was nurtured through my school career, leading me into a career as a newspaper journalist. I hope these names help fill in some of the gaps in the contributions above! I also spent my school years at Garth. 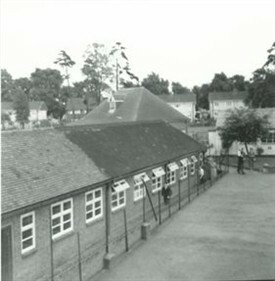 First in the Junior School and then the Secondary Modern, leaving in 1969 to join the RAF as an Airborne Radar Engineer. The only names I remember, aside from Mr Morris, are Mr Bannister (Maths and Chess Club) and Mr Dixon (Science). I actually lived outside the official catchment area in Central Road, but my parents registered me as living with my Grandmother in Middleton Road to get me into Garth. It obviously worked for me as I had a successful career in the RAF followed by even greater success in 'civvy street', finishing up as the Chief Aerospace Engineer for a very large American aerospace company. Reading through the memories of ex Garth pupils has sparked a few of my own, particularly of Mr Colclough. If memory serves, you owned a Volvo back in the late 60's? I also recall having geography lessons in the 'temporary classrooms' behind the canteen and standing guard outside the door while you had a crafty smoke! I was in the T stream with others such as Francis Brown, Robin Sponder, Lawrence Green, Paul Gibbons and a poor chap called Wigglesworth. I was the poster boy for under achieving and left with a smattering of CSE's. However, it didn't prevent me getting an Engineering degree in later life and being elected a Fellow of the Royal Aeronautical Society, so something during those years at Garth must have stuck! I still remember the year I spent there and I can still smell the woodwork and metalwork classrooms at the end of the ground floor. I remember a large classmate called Kenny Potter who was a boxer and was related to Don Cockell, the British Heavyweight Champion. Also I remember the school camp at the end of the school year at Henley Fort in Guildford. We were there when the Coronation took place and we went down to Guildford Cathedral for a service (they were still building it). Mr Bishop was there in 1952/3, we thought it great that our art master illustrated in the Eagle ( I bought the first issue, I wish I'd kept it. Ref. Mary Cooksey's 7 Nov 2016 message. Memories - I too remember the Bowyer sisters. I was in the same class with the elder of the two - I think it was Lesley. i had a couple of tandems but don't remember from whence they came or went. Do remember picking up Dave Stevens on the school run. Also remember Lesley Goslings piano recital. There has been no mention of the pupil who fell ill in America and made national news to fund his repatriation. Yes, Hugh Morris was a great Head master, some of his extra curricular activities were very forward thinking, I was on the first Duke of Edinburgh award scheme in 1958, I remember well the 3, day hike in Snowdonia, we were being watched from a distance by 2, athletes from the 56 Olympics John Disley & Chris Brasher, did they know we saw them.? Also in 1958 I joined the Easter continental trip to Venice & Lugano for the princely sum of 29 pounds, a lot of paper rounds and hedge cutting to pay for it.